People have been melting chocolate for dipping fruits and candies for generations. You can hardly go into a candy or pastry shop anywhere that doesn't have some delightful little chocolate covered treat for you to eat. We often don't give a lot of thought into how they are made because we simply enjoy eating them far too much to worry about such details. However if you wanted to make those treats at home for yourself or your family, would you know how? Melting chocolate for strawberries is not really all that difficult, you just need the right equipment to do it because you can't just throw some chocolate into a pan and melt it. Unfortunately chocolate has such a low melting temperature that even the lowest setting on any stove will scorch it and ruin it. So the trick to melting your chocolate properly is to use a pot in a pot system, otherwise known as a double boiler. A double boiler is little more than two pots or saucepans that are designed in a way that one fits inside the other without touching the bottom. Having the second pot suspended inside the first one is actually the key to what makes a double boiler work. If the second pot touched the bottom, it would receive too much heat from the stove and it would defeat the purpose entirely. By suspending the upper pot, the air between them forms a barrier that does a very good job of preventing the temperature of the upper pot from getting too hot. Double boilers are not very expensive if you just need a small one for melting chocolate for strawberries, and your local department store will sell them for around $20. If you need a bigger one, then you are going to have to be prepared to invest a little coin. You can also use a makeshift double boiler if you happen to have two pans that will nest inside one another. Or if you have a stainless steel or glass bowl that will suspend in a saucepan, that will get you by too. Take your double boiler, or whatever setup you came up with for the project, and fill the bottom pot with water but make sure the water does not touch the upper pot or bowl. Set it on the stove and bring the water to a simmer but do not boil it. Boiling the water will generate far too much heat and it will ruin the chocolate. Once the water is coming to temperature, place your chocolate into the upper pot or bowl. 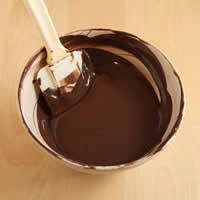 For this application you can really use any baking chocolate you have on hand for dipping. As the chocolate starts to slowly melt make sure you stir it frequently so that the melted chocolate doesn't scorch, and so that the unmelted pieces get enough heat and the whole thing melts evenly. Once the entire batch of chocolate is thoroughly melted, you are then ready for the best part of the process, dipping your strawberries! 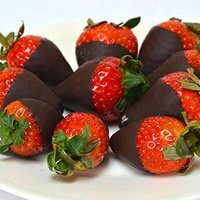 After you've had a chance to practice this process a few times, you can actually get really creative and have multiple double boilers going at once so that you can dip your strawberries in two different chocolates! Mmmmmmmm! Believe it or not there is actually a technique behind this process. Melting chocolate for strawberries is only the first step but learning how to dip the strawberries themselves is a whole other matter. Initially you are going to start off dipping them in plain chocolate and you'll be amazed at how great they turn out. Here's one tip, when you dip the strawberry and pull it out, give it a little shake as it comes out. This will cause the chocolate to spread out and fill any crack and crevices in the strawberries and give you a nice smooth finish. When the strawberry is completely out, give it a quick swirl to shake off any excess chocolate still hanging to the bottom. Once dipped, place your strawberries onto wax paper until cooled. They will be best served the same day you dip them, however you can refrigerate them a couple days as well. Once you get the hang of melting the chocolate and dipping the strawberries, you will inevitably want to start experimenting with new ideas. This is where it gets really fun! Take a walk through your local grocery store's baking aisle and see just how many variations there are to baking chips…chocolate isn't the only option available to you! Chocolate covered strawberries are amazing little treats and you just might find yourself growing a strawberry patch in the backyard just to have them whenever you want them! Don't be afraid to get creative with your chocolate too. For instance, if you like a softer chocolate on your strawberries, add just a little bit of shortening (1 tbsp per 12 oz) to your chocolate in the boiler. This will soften up the chocolate nicely and make it a little smoother as well. 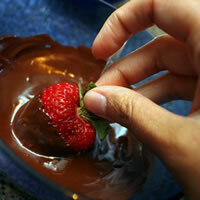 You can experiment with melting chocolate for strawberries and create various effects on your strawberries. 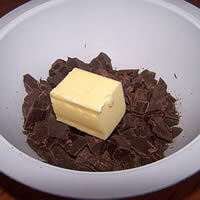 For instance you could have a double boiler of chocolate, and another with white chocolate. First dip the strawberry at a slight angle into the white chocolate, then once that chocolate cools, angle it the other direction and dip the strawberry into the dark chocolate for a stunning two tone effect. 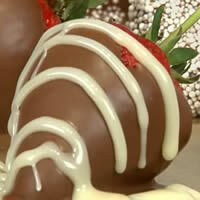 Ever wonder how they get the swirls and designs on the chocolate covered strawberries you see in the stores? They use a wooden skewer that is dipped in the chocolate and used much like a paint brush. You can also add food coloring to the white chocolate to create different colors. The possibilities are endless!